You can take part in the programme by coming to one of our dedicated Azure tours which are led by specially trained guides. You can pre-book your attendance in advance, or you can just drop in to one of the sessions listed below. We know schedules can change so don’t worry if you need to cancel a booking closer to the time. Chairs will be supplied throughout the galleries, and there are lifts and access for wheelchairs in both buildings. IMMA can provide manual wheelchairs if pre-booked with Caroline – see details below. The tour will conclude with an (optional) complimentary tea, coffee and biscuits with IMMA staff in the Itsa@IMMA Café. You can book for an Azure tour by contacting Caroline via email to edcommbooking@imma.ie or phone 01-612 9956. 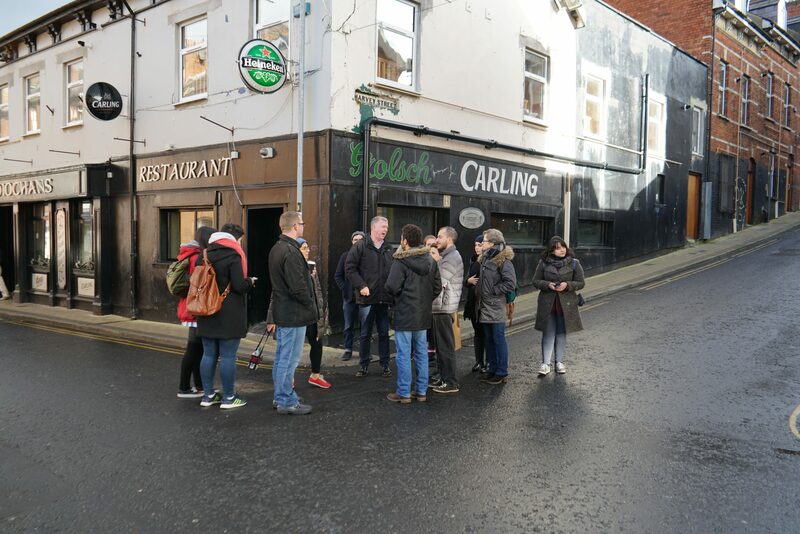 If booking in advance doesn’t suit you, you’re also more than welcome to come along to our tours as a ‘drop-in’ attendee – just meet us at reception at the times/dates mentioned above. IMMA is easily accessed by car or by public transport via bus and luas, with a short walk. If you are driving to IMMA there is ample parking on site. The car park is a paid car park but costs just €2 for the first three hours. The parking meters only accept coins so it is best to bring exact change with you. The Car Park is located behind the main Museum building and is signposted on entry. The front arch of the courtyard building is a set-down point for dropping off passengers. You can find out more information about how to reach IMMA, including a google map, on our website here. Please contact Caroline in advance of visiting if you have particular requirements regarding access. You will experience a friendly and relaxed atmosphere throughout your visit. IMMA’s experienced facilitators are specifically trained to offer Azure tours and are fully understanding and supportive of the particular needs of people living with dementia. When you arrive at reception for an Azure tour, you will be greeted by Aidan, Barry, Trish and Caroline. After a brief introductory chat, they will bring you to one of IMMA’s current exhibitions to begin your tour, which lasts forty-five minutes. 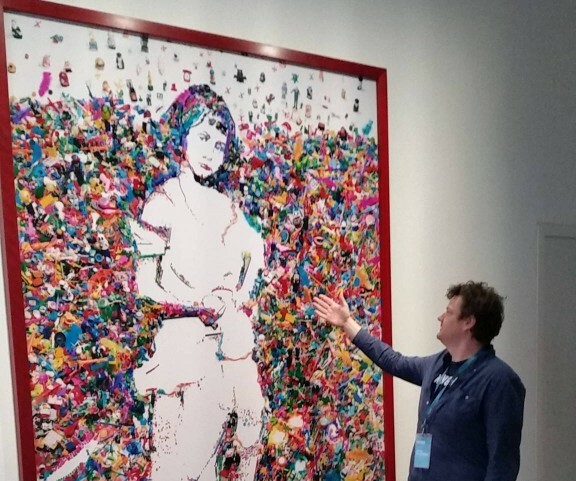 Up to five works of Art will be carefully selected beforehand by your facilitators, all connected by a theme. Your facilitator will give you background information about the artists and artworks and there will be plenty of time to take in the works on display at an unhurried pace. You will be invited to express your opinions and those who would like to share their ideas and personal connections will be supported to do so in their own time. Artworks can trigger lots of reactions and discussions are welcome. On the other hand, some visitors prefer to absorb the artworks quietly, and that’s fine too. 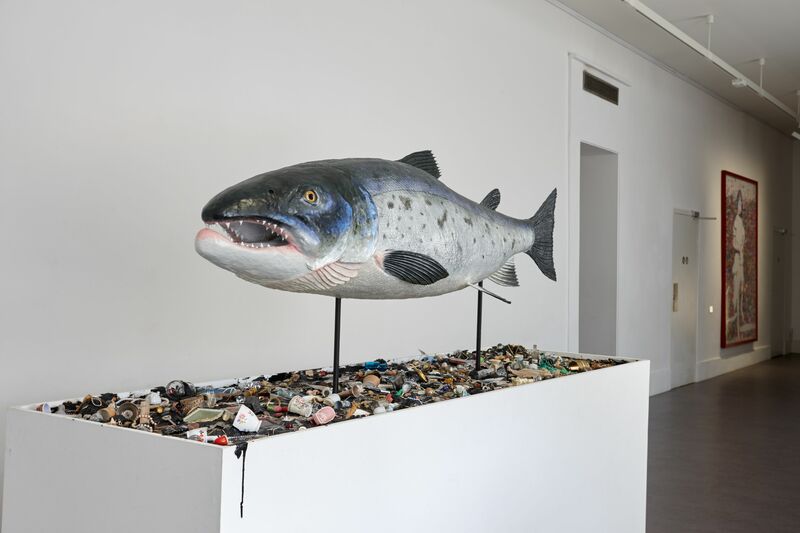 Mark Dion The Salmon of Knowledge Returns, 2015 Epoxy resin, steel, tar, wood, foam, paper, aerosol enamel, acrylic paints, adhesives, glass eyes, mixed media 196 x 300.5 x 90.5 cm, Collection Irish Museum of Modern Art, On loan from the artist, 2016. Photography courtesy of Dennis Mortell. 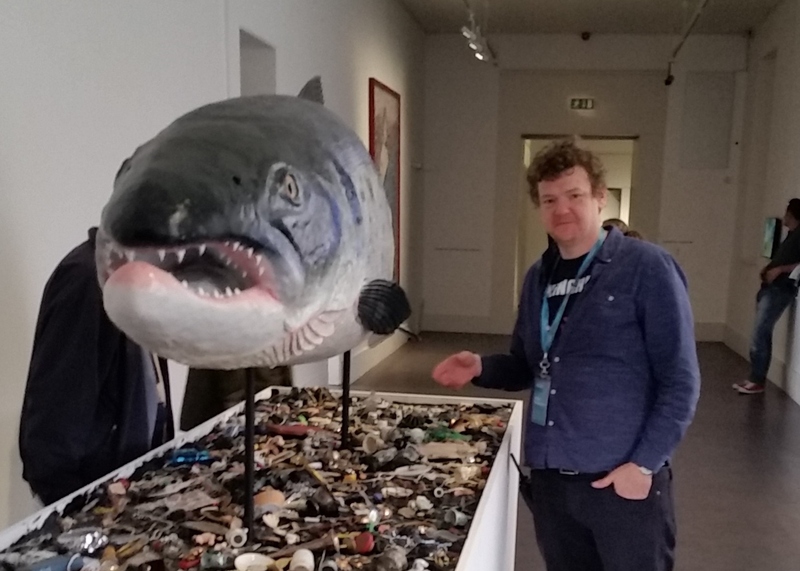 Barry’s recent tour of A Decade produced a lively discussion and much laughter when visitors encountered a giant fish made at IMMA last year by New York based artist Mark Dion, and a team of helpers. It is mysteriously titled The Salmon of Knowledge Returns. At first glance the gawping mouth and large teeth make you think of a shark, but the colours and shape of the fish are those of a mature salmon. An experienced fisherman on the tour pointed out that it is a male salmon – apparently you can tell by the shape of the mouth. The group debated whether all the curiosities lying underneath the salmon – china cups, children’s toys, plastic jewellery, were treasures or just discarded rubbish. Each conversation, in front of an art work, will last for 10-15 minutes. The tour will last approximately 45 minutes. Afterwards you are invited to join IMMA staff for complimentary tea, coffee and biscuits in the Itsa@IMMA Café. The Café is situated in the old kitchens of the Royal Hospital, another great talking point. We will take a short stroll across the courtyard to reaching the café, which is fully accessible by lift. The Azure programme was originally initiated through collaboration between Age & Opportunity, The Alzheimer Society of Ireland, the Butler Gallery, Kilkenny, and IMMA (Irish Museum of Modern Art). The Azure Network has now expanded to numerous arts venues nationwide including the founding organisations plus Arts & Disability Forum, Northern Ireland; Chester Beatty Library, Dublin; Crawford Art Gallery, Cork; DLR Lexicon, Dun Laoghaire Rathdown County Council Arts Office; Galway Arts Centre, Galway; The Highlanes Gallery, Drogheda; The Hunt Museum, Limerick; the LAB, Dublin City Arts Office; The Luan Gallery, Athlone; The National Gallery of Art, Dublin, and West Cork Arts Centre, Co. Cork. If you are interested in a dementia-friendly experience in any of the galleries above you can contact them directly and ask for more information on Azure tours. If you are interested in hearing more about upcoming dementia-friendly tours and events at IMMA please join our Azure mailing list by clicking here. E.gress, by artist Marie Brett and musician Kevin O’Shanahan, maps a world of loss and change, exploring how individuals diagnosed with dementia find new ways to adjust to changing world.